We're almost through our time in Paris and have so much to share! One of our favorite things so far has been museum hopping. 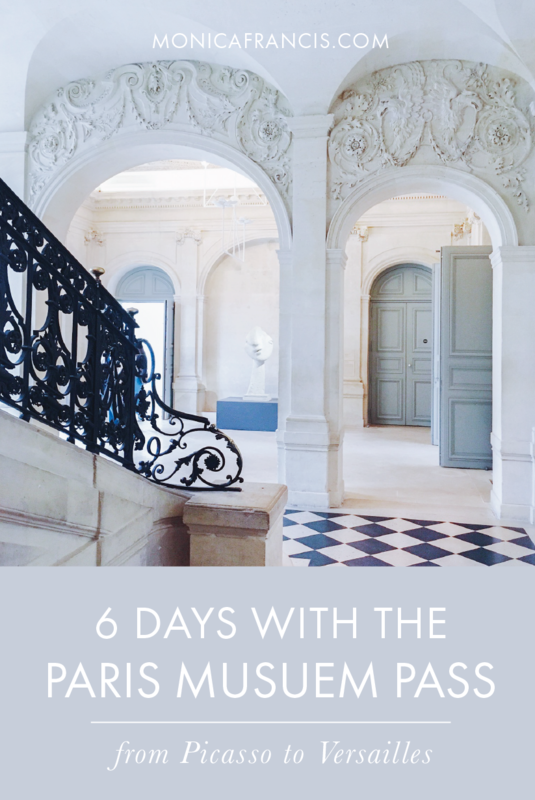 With lots of rain in the forecast and many museums and monuments on our list, we did a little math and decided to spring for the 6-day Paris Museum Pass. You will still need to queue to visit the Towers of Notre Dame (no line-skipping here), but our wait wasn't too long. After climbing over 400 stairs (also no elevators here) you're rewarded with some pretty spectacular views of the city, the architectural detail of the Cathedral, and the famous gargoyles. We planned to add either Sainte-Chapelle or the Architecture Museum to this day, but the weather was so sunny and beautiful that we opted for ice cream from Berthillon and a picnic at the end of Ile Saint-Louis. We're so glad we did - it's been raining ever since and the place where we picnicked is now a several meters under water. After dinner, we went to watch the the sunset and the evening's first Eiffel Tower sparkling from the Arc de Triomphe. We certainly weren't the only ones who had the idea - lines were long, but here you can skip both the ticket and security lines, so we made it up with time to spare. It's a fantastic 360-degree view of the city, and quite possibly my favorite. To top it off, the nearest Ladurée stays open late, which means you should probably get a few macarons to eat while you walk back down the Champs-Élysées. 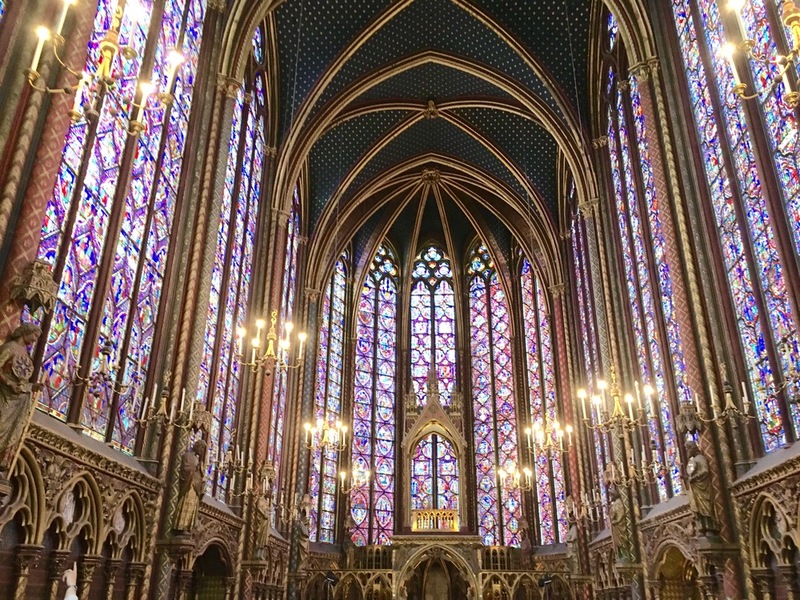 The next day, we walked to Ile de la Cité and visited Sainte-Chapelle. You do need to wait in the first line for security, but then skip the ticket line at the door and head up to the chapel. When I visited a couple years ago, two of the windows were undergoing restoration, so it was wonderful to see the chapel in its full splendor. Even more awe-inspiring to be in the chapel when a thunderstorm broke out above the city. At Musée de L'Orangerie you can skip both the security line and the ticket line, so we weren't stuck out in the storm like many others. Of course you're here for Monet's Water Lilies, which are incredible to see in person. But we were surprised to find that the galleries downstairs held some really fantastic exhibits - a collection of paintings by well-known artists, and one about the poet and art critic Guillaume Apollinaire. This was a museum-packed day, starting with Musée Rodin - our favorite museum to date! You can skip to the front of the security line, skip the ticket line, and walk right out into the gardens to see The Thinker and the beautiful Hôtel Biron. We wandered the grounds for a while before going in to see the rest of the collection, and then returned a few days later to see the gardens again sans rain. Everything here was impeccably designed, from the mansion itself to the beautifully curated galleries and the sculpture garden that was begun by Rodin when he lived here. Just across the street is Les Invalides, the largest military museum in the world and home to Napoleon's tomb. To get to it, you need to wait in a security line before walking onto the grounds and over to the Dôme des Invalides (no need to stop for tickets). Napoleon is not the only French war hero buried here, but his tomb is by far the most magnificent. You could stay and see more, including Napoleon's horse - preserved and stuffed and on display - but we headed off to our next stop. We ended the day with the nearby Musée D'Orsay. You'll get to wait in a shorter security line, and bypass the lines at the ticket counter inside. You know you want to visit the Impressionist wing, so dart up to the 5th floor to see plenty of famous works and to get a picture of the old train station clock-turned-Instagram opportunity. We moved on to the sculpture galleries and ended with the Post-Impressionists before the museum closed for the day. The Louvre is busy on any day, and the pass will get you into the shorter security line at the glass pyramid. Arrive as early as you can and run to the Mona Lisa if you want to pay her a visit - the crowds here only get worse throughout the day. From there, we saw the crown jewels and the Napoleon III apartments before stopping for lunch. The less-crowded upper floors are the place to be after noon, so we next headed through Decorative Arts, up to French and European painters, and down through some sculpture on our way out. On our fifth day, we made the day trip out to Versailles. While you don't need to wait in a ticket line, everyone must wait in the same security line - yes, the long one. Once inside, cross the courtyard to pick up your free audio guide and tour the palace. Be astounded by the opulence - it's easy to see how it would incite a revolution. We did need to buy tickets for admittance to the gardens because of a special presentation that day, but it was still worth it to see the insanely expansive grounds and get lost in the 'countryside' near Marie Antoinette's Hamlet. To finish our museum tour, we spent a morning at the Musée Picasso. There's no line-skipping here: wait in the security line, go to the ticket counter and show your pass to get a paper ticket. This museum was recently renovated, so take time to admire the beautiful space along with the artwork. And do visit the rooms in numerical order so that you follow the chronological story of Picasso's life, work and process. You may not find all of his most famous works in this museum but you will come away with a greater appreciation for the artist himself. In the end, the Museum Pass saved us enough cash for a nice Paris dinner, wine included. We also saved some precious time by skipping lines - though you can often skip the same lines by purchasing a regular ticket in advance. If you're wanting to visit enough spots for the pass to at least pay for itself, it's lovely to have unlimited entry and the simplicity of buying one ticket for so many activities. It was so worth it for us! We could have easily fit in more than 10 visits if we were packing our schedule more tightly - but we loved our 6 days, and did finally make it to the Architecture Museum on Paris' Free First Sunday.